During trips to the grocery store when, as we're heading toward the dairy aisle, both girls claim they need to go potty, which involves a hasty cart ride to the opposite end of the store and often a false alarm from the younger one. At home as they kick, pull hair, bite and otherwise maim each other over infractions including, but not limited to, pony, doll and book theft; claiming ownership of a parent ("That's my mommy!" "No!! It's my mommy!!" "NO!!!! MY MOMMY!" etc., etc., etc. ); and sitting on an already occupied piece of furniture. After the playdate when I heard my friend exclaim, "Jovie, what's that all over your leg?" and found that my 2-year-old, who was going commando in an attempt to potty train, was covered in poo (as was a throw rug, various stuffed animals and a "Frozen" puzzle). This, just after I'd cleaned up a puddle of pee on the floor. And especially night after night when, after putting the kids to bed at 8 or so, I flip open my laptop and work until past 11 then get up by 6 or 7 the next morning to repeat the cycle -- make food, referee, play, read, clean, more food, clean, play, work, food … I don't even know. Last week we went to the beach with my family. Twenty of us total, 10 kids. I worked one afternoon and then decided not to use my laptop for anything work-related for the rest of the week. Instead, I immersed myself in family (well, except for the day or two I immersed myself in bed with a stomach bug). I went on bike rides and raced down water slides with my nephews, spent an afternoon window shopping with my niece, chatted and laughed with my sisters, soaked in all the magical moments of the girls giggling amidst a pack of cousins. On the last day, after a frustrating morning with my vacationed-out kids, I ran into the ocean, diving into the rising waves that previewed Hurricane Arthur. I swam and floated and meditated and then headed back to the beach, grabbed one of my sisters and brought her into the water so that we both could enjoy being cradled by the cool waves. In that moment, I thought I could've stayed in the water forever. It felt like it would've been easier to swim and swim and swim -- to cross the Atlantic even -- then it would be to go back to the routine. But I got tired eventually and went back to shore. Of course, I went back. Returning home was tough. I missed my nieces and nephews and the endless bustle of the beach house. The camaraderie of sharing motherhood with my sisters. And I really dreaded going back to nights doing work that isn't always gratifying and that seems to perpetually be keeping me from the work I actually want to do. And we all know what that is by now. I think some days my expectations for the 24 hours in a day are just too high. And I feel guilty and kind of lame for whining or complaining. This is the adventure of every mom in the history of mothers, right? We love our babies and relish the time we have with them while simultaneously mourning the life before or the life more balanced. Some days I wish I didn't want so much to finish my book. If I wanted it less, then maybe it wouldn't be so infuriating when there's no room for it. But it's this inexplicable force in my life. "There is no one to tell this to and yet it seems very important to get this right. The reality and what it is like to escape it. That even now it is sometimes too beautiful to bear." "The satisfaction of composing. Remembered that Dylan Thomas sometimes would set down one word of a new poem then walk down to the pub and get shitfaced in celebration. For breaking the void of silence." So tonight I thought I'd break the void of silence. I'm tired and frustrated and defeated. But there's satisfaction in writing about it. I think I've decided I'm going to try to say "no" more. Each time I say "yes" to taking on a new project or extra work, I'm saying "no" to completing something that might be fulfilling to me. It's easier to say "yes" to everyone else. There's no guilt associated with it, for one. And of course, it's nice to contribute to the family. But if I'm being honest, it also gives me an excuse not to face the right side of my brain and the terror involved with finishing what I started and showing it to someone. Anyone. I think saying "yes" is the Achilles Heel of most stay-at-home moms -- or moms in general. You start feeling like there shouldn't be space carved into your life for just you. Even acknowledging that you want that tiny corner for you feels very un-momlike. But I don't feel very mom like lately anyway. I'm a better mom when I feel like I have time to do something that's just mine and no on else's. It puts my life in perspective. It allows me to smile more at all the sweet, silly moments. The extra hugs and kisses at bedtime. The way Jovie holds her little pointer finger beside her face when she asks a question. How Lily requests to wear a "dressing gown" like Fancy Nancy for bed every night. How now when we drive by a field of tall, green stalks Lily shouts out, "Mo-om! Corn poppin' up!" 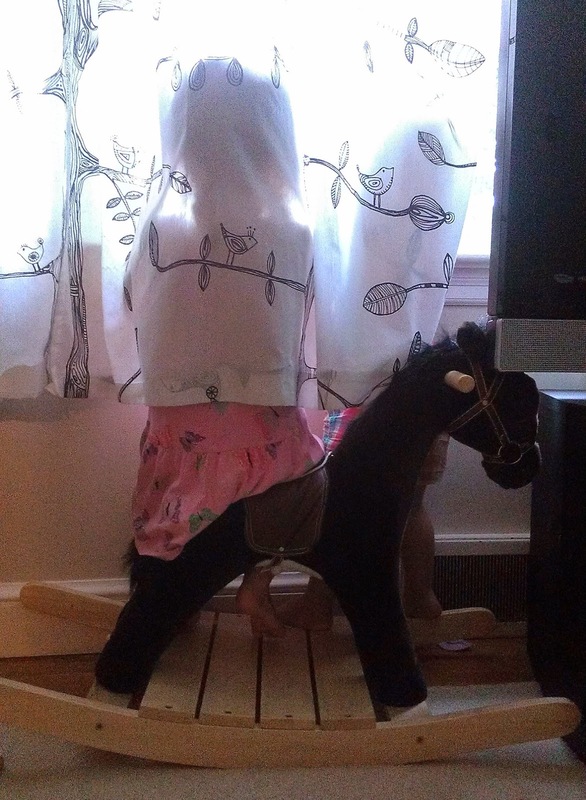 Or, when the girls sit on the rocking horse in the living room together, hide behind the curtain and play with their princess ponies on the window sill -- chattering away and inventing whole plots and subplots. I remind myself, it won't be like this forever.